You'll get precise monitor calibration using a basic mode with preconfigured settings or an advanced mode with settings for white point, ambient compensation and precalibration. It also has the ability to capture the ambient light within a room or a light box for an impressive level of color calibration. The ColorMunki is even capable of fast and accurate projector profiling to project your images to your clients, family, or friends with color confidence. It's RGB and CMYK printer profiling technology provides complete color control along with optimized printer profiling, and has the ability to optimize specific colors, black & white shades, and flesh tones to ensure that the color you see is the color you get. Plus there is no need to read individual color patches because ColorMunki's super fast printer profiling can rapidly scan test charts in less than one minute. Quick, easy, and accurate display-to-print matching is what the ColorMunki is all about. The included software guides you through whichever profiling function you desire. You can select "match my printer to my display" and you'll be completely guided through the profiling process, or you can easily jump right to display, projector or printer profiling. The ColorMunki calibrates LCD & Laptop monitors using either the Easy or Advanced mode. The Easy mode has predetermined selections, so you don't need to be a color expert. For those looking for more control over whitepoint or ambient measurements, choose the "advanced" mode. The DDC auto detect control will quickly determine if your monitor is compliant and if so, perform one button display profiling. ColorMunki can also calibrate multiple displays with ease, and provides before and after visualization, as well as calibration reminder prompts. The ColorMunki can profile RGB and CMYK printers, and delivers outstanding printer profile quality for print color that matches what you see on your screen. You simply scan one test chart of 50 patches, and ColorMunki calculates an interim profile and learns how your printer behaves for these colors. It then produces a second chart that perfects your profile once you scan it. The ColorMunki even has the ability to optimize for specific colors, black & white, and flesh tones from individual image types. And the ColorMunki's super fast scanning capability can rapidly measure test charts in less than one minute, so you don't lose precious productivity time with the process of printer profiling. ColorMunki includes software to help manage and fully utilize your color profiles. ColorMunki's AppSet talks with your photo and design applications to automate printer profile setting, and with PrintSafe checking capabilities, you'll be able to preview your color palettes under different lighting sources or printing processes before you go to production. ColorMunki can capture colors from virtually anywhere to enhance your editing and design creativity. It can automatically extract the top colors from any image or you can go directly into your image and add any color to your palette. ColorMunki also lets you grab any color from the visible spectrum - quickly and accurately capturing spectral color from any surface and import it directly into your photo and design applications. The ColorMunki optimizes the shadows, highlights, and balance of your images, so no matter how you show your work, the world will see exactly what you intended. You'll share your images with confidence with DigitalPouch, a self-executable application that checks for ViewSafe* conditions on the receiver side. Simply drag and drop the images you want to transport into the pouch and "zip" it up to send. The receiver will be able to view the images in the same application viewing screen, while the application looks for and verifies that an accurate, up-to-date monitor profile is in use. Amazingly, this assurance of viewer color does not require the receiver to own any version of the ColorMunki software. * ViewSafe Image Transport runs on Mac and PC, and is compatible with Adobe Photoshop, Adobe InDesign, and QuarkXPress. 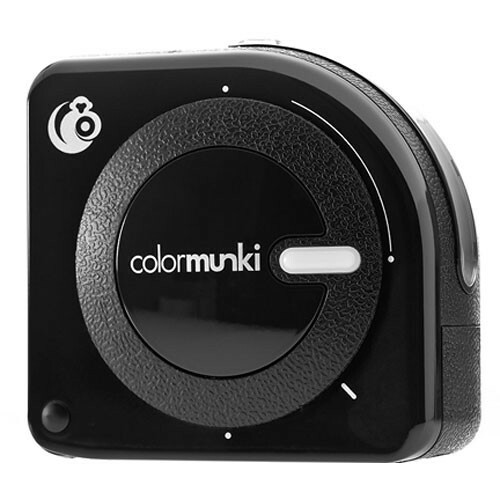 ColorMunki Photo Color Management Solution is rated 4.5 out of 5 by 450. Rated 5 out of 5 by Usman H. from This Munki means business! First of all the colormunki photo cost me an additional 250 dollars or so because of international shipping and customs duties, so I wanted this to be exceptionally good, which it simply is. I have so far calibrated 3 monitors. 1 HP laptop, 1 imac 27 and 1 27 inch ASUS, all of which had minds of their own as far as dealing with colors was concerned. Remarkably enough, after calibration, they all look pretty much the same and yes I do understand that the laptop display will have its own drawbacks. I had no idea my displays were off by this much. And finally now my prints also look pretty much the same as they do on my displays. No more color casts and dark prints. Worth every penny. Rated 1 out of 5 by Anonymous from Extremely Poor Support The product worked intermittently at first but eventually got the job done. A few weeks later it won't even connect to either of my computers except very sporadically. B&H refused to take it back and sent me to the manufacturer. XRite has made me jump through many hoops for a couple of months now. After many attempts I got it to connect to one of my computers again so I could print out a systems report for them. Now they deny receiving it. The rep I was working with eventually agreed to replace it but nothing happened. I contacted them again and got switched to a different rep who wants me to start over, test it again, send him system reports, etc. They refuse to replace it and they don't even keep their word. Don't do business with them. It's a rip off. Rated 5 out of 5 by Anonymous from WOW I used the Colormunki the first day I got it to calibrate my monitor and get it to match my printer. It took a few minutes to go over the instructions and ensure I was following them correctly. I wanted to get it right. With all the putzing and double-checking, it took about 40 minutes. To do it again will take about 20 minutes when I need to profile another paper or re-profile my monitor. This is way too easy to produce results this good! My monitor shows colors and gamut amazingly close to what comes out of the printer. It was exactly what I needed and have recommended it to photographer friends. I was slightly nervous about the price, but consider it money well spent. Rated 4 out of 5 by Anonymous from Tough Install I bought this to calibrate my Eizo and printer after upgrading my computer. The product works beautifully once installed. Absolutely no problems profiling either the monitor or printer. HOWEVER, installation was far from easy. After several hours on the web searching the FAQs and support pages, I finally found answers to why the machine wasn't recognizing the device. I sent an e-mail to Xrite, however after two days of waiting without a response, I went searching again and found the solution on a support page for a color management equipment reseller. Once corrected, all works great. Rated 5 out of 5 by Anonymous from great product Even with calibrating my monitor, I've been having minor problems getting my prints to look right on my Epson 4000, especially with non-Epson papers. The ColorMunki has solved that. I've now profiled all the papers I use, each one taking about 30 minutes, and the prints are looking a lot better, most of them extremely close to the image I see on the monitor. It's simple to use. The software guides you through the process. Highly recommend this for anyone who wants more exacting profiles for their prints, no matter what paper you're using. Rated 5 out of 5 by Rich the Baker from Xrite ColorMunki - Easy to Use The beauty of this device is that fact that you can now match your printer to the monitor to get output as close as possible to what you are viewing on screen. A time saver and paper saver. It's very easy to use even in the advanced mode. It walks you through every step and setting required to set up your monitor and printer. I highly recommend the ColorMunki for anyone truly serious about getting quality output of your images. I only wish the side button was located in an area not so easily touched by your thumb when turning the dial. I found it sometimes initiating a step that I wasn't ready for when turning the dial. Other than that little gripe, worth the investment for such a state of the art device. Rated 5 out of 5 by James from ColorMunki vs. Spyder After using a Datacolor Spyder3 and SpyderPrint to profile my NEC67CE monitor and Epson 3880 Printer (using a PC with Windows 10), I decided it was time for an upgrade/change.? I switched to the ColorMunki Photo, and I'm glad I made the change.? Both the ColorMunki and the Spyder3 give acceptable results, but the ColorMunki is hands-down easier to use in profiling the printer.? For profiling the monitor both the ColorMunki and the Spyder3 are fairly user friendly and easy to use, but the SpyderPrint is finicky and is difficult to use correctly.? For printer profiling, the ColorMunki is way better than the Spyder.? If you're trying to decide between the ColorMunki and the Spyder, get the ColorMunki.? One device does both tasks well and gives you great results. How long time is the warranty? Can I get an extended warranty? RE: COlorMuinki Photo Color Management System - can the printer profiles created by this package (adduming the monitor has been calibrated) be tweaked - adjusted? Or is it necessary to create an entire new printer profile if the first one isn't quite accurate? Yes, you should be able to customize and adjust a printer profile to your needs with this product. Based on spec sheet; OS 10.6.8 won't work. You need 10.7.x or newer. I have been updating my Colormunki software and my OS is currently 10.12.6, and it works well. If you don't want to update your OS, contact X-Rite and ask them via email. They are very responsive. How helpful is this tool to me if I'm looking to match dual monitors with the actual print but an outside vendor will be doing the printing? I use different vendors depending on the job and my colors never match. Is there a better tool for me? Thanks so much! If you buy the Older Color Munki Photo you can get the up grade to the new software for free. I have been told that the devices are the same except the new one is white. I have a wide gamut NEC monitor with it's own calibration device but want a device that will make profiles for my printer paper combinations. Will this device profile printers without trying to or needing to calibrate my monitor, or interfere with my NEC software? How do I get the software to work on a 4K laptop screen? The menu windows are so compressed that you can't read the screen or the buttons. I don't know what laptop or Operating System your using, but the issue lies with the os software not with the calibrator. You'll need to change the screen size parameters or icon size parameters in the OS to solve this.